After a very successful SAPS Meeting in Liverpool, the opinion of the majority of SAPS Members was that it should be an annual event. So Nick and I, helped by Richard and Vandra Stewart, have organised an entertaining programme for Tuesday 2nd July to Wednesday 3rd July in Nottingham this year. 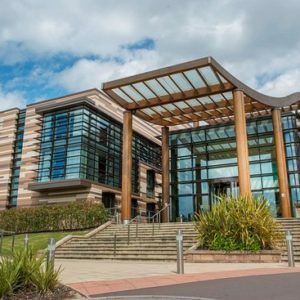 We recommend we all stay at the Conference Hotel which is De Vere Venues Orchard Hotel in University Park, University of Nottingham. Standard room B and B including VAT is £108 for 2 per night. Superior rooms are available. The Hotel is next door to the East Midlands Conference Centre where the BAPS Meeting is being held. The Wednesday, Welcome/Presidential evening Reception is Drinks/BBQ/entertainment, also on the University Campus. There is a tram into Nottingham City Centre or a bus from nearby Wollaton Deer Park. Both the tram and bus stop are a 10-15 min walk from the Hotel/Conference Centre. For Tuesday evening and Wednesday morning SAPS events we will arrange 16 seater mini buses or taxis for 4 with dgcars (0115 950 0500) each with a fixed price rate of £2 per person each way from Orchard Hotel. There are obviously other Hotels in the City Centre e.g. Jurys and St James, both located along the tram route, and all available through BAPS Congress 2019 , Hotels. Check in to the Orchard Hotel Tuesday afternoon 2nd July. Meet in the foyer by 5.30pm. 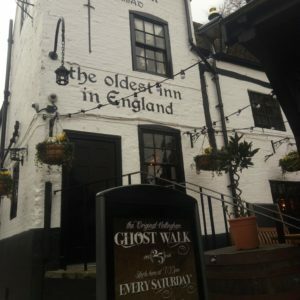 Minibuses or taxis will leave at 5.30pm to take us to Ye Olde Trip to Jerusalem said to be the oldest pub in England. It is built on the same rocks as Nottingham Castle (which is sadly closed for renovations). We have 2 rooms reserved from 6-7.15, called ‘The Rock Lounge’, part of the ground level caverns, with its own bar. We will then stroll up by the Castle walls to World Service Restaurant housed in a 17th Century building where we have the Blenheim Room reserved for our own use. The Restaurant can be found in AA and Michelin guides. There will be a 3 course dinner with 4 choices for each course to be ordered on the night at a fixed price of £29.95 plus £10 for half a bottle of wine plus service. Minibuses or taxis will take us back to the Orchard Hotel at 11pm. Wednesday morning – breakfast is available from 7am at the Orchard. Minibuses or taxis will leave the Orchard Hotel at 9.30am to go to the City of Caves and National Justice Museum. Tickets are £13 each with group and concession to visit for both, or £6.95 for Caves only, and £ 9.95 for Museum only). We have 2 potential tours of the Caves at 10am and 11am since each tour only takes 20 people. There are 30 steps down to the Caves: the 1st 15 steps are a low step wide spiral and the 2nd 15 are slightly steeper and straight down. I can do them easily following my hip and leg surgery and walking with a stick! If you don’t want to do the Caves there is a lovely church next door to the Museum (St Marys) or the Nottingham Contemporary Gallery (where we will have lunch) is by the entrance to the Caves. The guided tour of the Caves takes 45 mins across slightly rough ground. 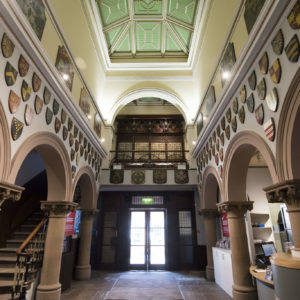 The National Justice Museum is one of Nottingham’s extraordinary historical haunts – 15th century gaol and courtroom and descend by lifts into the depths of the prison, to explore the underground cells and hear tales of the condemned. We will meet for a light lunch at Nottingham Contemporary Art Gallery in the Ottar Café accessible by lift. Tables will be reserved and there is outside seating if the weather is as it should be! Minibuses and Taxis will then take us back to the East Midlands Conference Centre (EMCC) for those who want to attend the afternoon session of the BAPS Conference and have tea with the delegates. 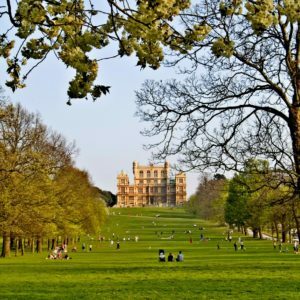 Alternatively you could walk in Wollaton Park with herds of Red Deer and visit Wollaton Hall, or you could remain in town and wander round Nottingham, visit the shops, and return by tram or taxi! Wednesday evening is the Welcome /Presidential Reception on Campus 5 mins walk from the Orchard Hotel and the EMCC. This starts at 7pm and is drinks, BBQ and entertainment. 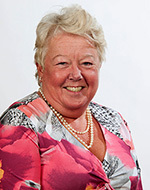 We hope this entertaining programme is to your liking and you will join us in Nottingham.